"Тим, что это за рыба?" Translation:Tim, what kind of fish is this? Can someone elaborate on why "Tim, what fish is that?" Is incorrect? ^^ thank you. It's not technically incorrect since you could say "fish" to mean "type of fish"; however if they accepted that answer people would be marked correct for misinterpreting it to mean "what (individual) fish". That wouldn't be correct in standard English, since you would normally say 'what kind of' or 'what type of' . Perhaps someone can explain this sentence? My understanding is that за usually means "for". So is "что это за" simply a common idiom meaning "what kind of ... is this"? Yes, better think of "что это за" as a whole idiomatic pattern. Like "потому что" meaning "because" (porque), while потому by itself is "therefore" (por lo tanto). They are related, but the combination works quite differently like a whole new expression. Actually, it kind of makes sense, in this case; "what is this for a fish" gets across, somewhat obliquely, the same idea if you ask me. [ что это за ] ‧ is a fixed phrase used as a routine inquiry, rhetorical question and exclamatory expression. The phrase meanings are broader than the, [ кака́я како́й како́е каки́е ] [ what ] [ what kind of ] inquiry. Is it incorrect English to write What is this kind of fish ? I've heard it. I think that's perfectly acceptable. It's uncommon, but not incorrect. My answer of Tim, what kind of a fish is this? was rejected. Both should be correct but my answer is more likely in the USA. The meaning is slightly different. If you are holding a fish you just caught my question would be used 99% of the time. If there is a cooked fish on your plate, the given question is better. Why is "fish" in the nominative case after "za"? Why not accusative? 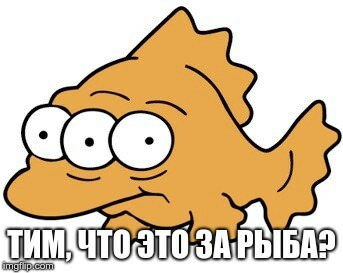 Why doesn't it have to be: Что это за рыбу? After за is nominative?